SCOTTSDALE, ARIZ, April 26, 2016 – As recently announced on national television, The Stinger will be auctioned leading up to the 100th running of the Indianapolis 500 by Barrett-Jackson, the World’s Greatest Collector Car Auctions®, bringing the one-of-a-kind fundraising project for St. Jude Children’s Research Hospital® to a close. 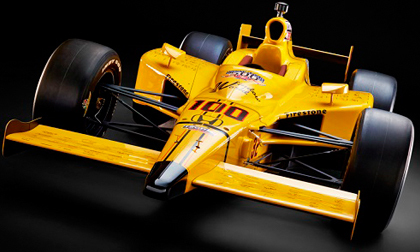 The Stinger IndyCar is an interpretation of the 1911 Marmon Wasp, the first-ever Indy 500 winning car. Racing great John Andretti is lapping the country with The Stinger to get the signature of every living Indy 500 veteran. The car, adorned with 249 Indy drivers’ autographs, will be auctioned off the week before the Indy 500 with one hundred percent of the money raised to be donated to St. Jude Children’s Research Hospital®. Window World commissioned the building of The Stinger, including state-of-the-art aerodynamics and a meticulous recreation of the yellow and black color scheme and infamous wasp-like tail of the Marmon Wasp. Honda graciously donated an Indy-race-winning engine. Barrett-Jackson is the industry leader in collector car auctions and automotive lifestyle events. For more than 45 years, the company has specialized in providing products and services to discerning classic and collector car owners and automobile enthusiasts around the world. It also has an extensive history with philanthropic events with more than $88 million in sales for charity car auctions. The names on The Stinger are a who’s who of racing legends from all genres and forms that have raced in the Indianapolis 500. Big names like four-time winners A.J. Foyt, Rick Mears and Al Unser Sr. are prominent, along with other greats such as Jackie Stewart, Emerson Fittipaldi and Cale Yarborough, as well as recent superstars like Danica Patrick and Tony Stewart. The Stinger is a piece of history and a monument to the sport. Window World believes that the car will sell for $1 million or more. Whitworth anticipates that heavy hitters in the racing world will bid, along with some corporate giants who want to show their philanthropic spirit. The Stinger is a history-making IndyCar, an interpretation of the 1911 Marmon Wasp, the car that won the first-ever Indianapolis 500. Racing great John Andretti is lapping the country with The Stinger to get every living Indy 500 veteran to sign it. The car, adorned with 249 racer autographs, will be auctioned May 25 ahead of the 100th running of the Indy 500. One hundred percent of the money will go to St. Jude Children’s Research Hospital®. Window World, America’s largest replacement window and exterior remodeling company, paid for the meticulous building of The Stinger. Window World®, headquartered in North Wilkesboro, N.C., is America’s largest replacement window and exterior remodeling company, with more than 200 locally owned and operated offices nationwide. Founded in 1995, the company sells and installs windows, siding, doors and other exterior products, with more than 10 million windows sold to date. Window World is an ENERGY STAR® partner, and its window products have earned the Good Housekeeping Seal for seven consecutive years. Additionally, through its charitable foundation Window World Cares®, the Window World family provides funding for St. Jude Children’s Research Hospital®, where it was named New Corporate Partner of the Year in 2010. Since its inception in 2008, the foundation has raised more than $5 million for St. Jude. Window World, Inc. also supports the Veterans Airlift Command, a nonprofit organization that facilitates free air transportation to wounded veterans and their families. To begin your exterior remodeling project today, visit www.WindowWorld.com or call 1-800 NEXT WINDOW. For home improvement and energy efficiency tips, décor ideas and more, following Window World on Facebook and Twitter. Established in 1971 and headquartered in Scottsdale, Arizona, Barrett-Jackson, The World’s Greatest Collector Car Auctions®, is the leader in collector car auctions and automotive lifestyle events. The company produces auctions in Scottsdale, Arizona; Palm Beach, Florida; at Mohegan Sun in Connecticut and Las Vegas. With broadcast partners Velocity and Discovery Channel, Barrett-Jackson will feature live television coverage in 2016, including broadcasts in more than 100 countries internationally. Barrett-Jackson also endorses a one-of-a-kind collector car insurance for collector vehicles and other valued belongings. For more information about Barrett-Jackson, visit http://www.barrett-jackson.com, or call 480-421-6694.